Perhaps the next best thing to having a surgeon beside you to field dress a downed game animal is a replaceable-blade scalpel sharpened to industrial standards. In other words, a skinning knife from Havalon Knives, a division of Havel’s, Inc.
“Since 1981, Havel’s has provided the longest-lasting surgical blades available for a variety of uses,” says Havalon President and CEO Pat Carrothers: “Medicine, taxidermy, industry, sign making, graphics and crafting. “At Havalon Knives, we’re dedicated to the Havel’s tradition of continuous quality improvement in blades and knives for professional hunters, trappers, guides, and taxidermists—as well as individuals who value the highest quality in their sporting knives. Havalon is the company bringing the “Quik-Change” Piranta hunting and skinning knives and new Baracuta fillet knives into the outdoor market. In 2011 Carrothers and company attended the Archery Trade Association Trade Show for the first time—and National Sales Manager Paul Schwartz says they picked up more than 30 new dealers. So they’ve already reserved space for the 2012 Show in Columbus, Ohio, January 10-12. Hunters who handle a Havalon skinning knife will immediately feel the difference between it and their “regular” knife. It is true that a “regular” knife—a resharpenable style that outdoorsmen have traditionally carried—can come in a bewildering variety of styles and weights. Handles may be bone or micarta or wood. The designs may be folders or fixed blades—and the blades themselves come in a multiplicity of lengths, grinds, angles and steel hardness. The trick of course is to match the size, style, and perhaps even the cost to the task. The Havalon Whitetail Skinning Knife ($44) weighs just 2.2 ounces. A purchase includes a dozen additional #60XT blades. Ambidextrous thumb studs allow one-hand opening and this knife series is built with frame lock construction. The Whitetail Skinner has a 6061T aluminum alloy handle which gives it the feel of a larger, metal handle hunting knife without the weight. The handle has a cross-hatch pattern for a better grip during what can sometimes be a messy job of skinning and caping a big deer. This knife features scrimshaw-style art of a trophy whitetail inset in the handle. The laser-engraved art is designed by award-winning scrimshaw artist Linda Karst Stone. Additional packs of a dozen 2.75-inch surgical- edged stainless steel skinning blades for the Whitetail Skinner—indeed blades that fit all of the Piranta skinning knives and also the #8 and #74 surgical handles—cost $5.25. Havalon Baracuta Fillet Knives operate on the same principle as the Piranta series, but both blade and handle are longer…and we mention this because many archers are also fi shermen. The Baracuta-Edge Pro Fillet Knife $55 has a 5-inch micro-honed Japanese stainless steel blade, a black Zytel plastic handle with orange rubber inserts for better grip and less slippage. This fillet knife has an open back for easy cleaning, plus ambidextrous thumb studs and a removable pocket clip with liner-lock construction. The overall length is 11 inches yet it only weighs 3 ounces. A 5-pack of Baracuta replacement blades is $15. “A customer’s satisfaction is guaranteed or we will refund their money,” Schwartz says. But aren’t scalpel blades too light and thin for skinning jobs? According to Schwartz, the answer is no. Schwartz cautions that a knife, whether a Havalon Skinner or some other more traditional blade, should only be used for its intended purposes. 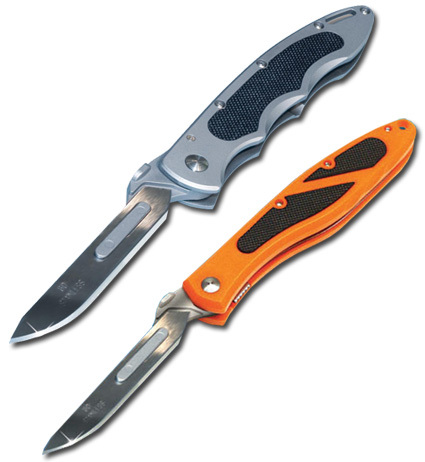 For more info check the Havalon Knife web site www.havalon.com, follow them on Facebook.com or call (800) 638-4770.